Click here to learn more about mbaMission's products and services. Are you thinking of applying to business school this year? Perhaps you are just starting to prepare for the GMAT or GRE exam, or maybe you have not yet begun to assess your overall fit at the top business school programs. How will you differentiate yourself from so many other applicants? Where will you start? We know you have questions as you prepare to begin the application process. 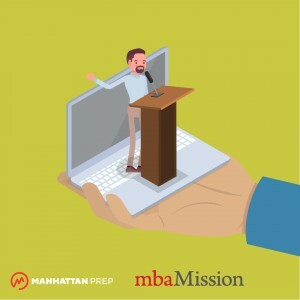 The leaders in the MBA admissions space—mbaMission and Manhattan Prep—are coming together to make sure you will be ready for the 2019–2020 MBA admissions season. Join us for a free, five-part online event series, “Maximize Your Potential: Five Steps to Getting Your Dream MBA,” that will answer all your MBA admissions questions—from taking the GMAT (or GRE) to assessing your MBA profile and eventually applying (and being accepted) to the school of your dreams! During the live online series, Senior Consultants from mbaMission will address and explain different significant admissions issues, while experts from Manhattan Prep will help you tackle some of the toughest challenges GMAT and GRE test takers face, offering valuable insight and advice. These live online events will be held once a week from 8:00 to 9:00 p.m. EDT. Please sign up for each session separately via the links below. Space is limited. Attending business school is a huge investment—of time, emotion, energy, and money—and the experience will undoubtedly change your life, both professionally and personally. So you owe it to yourself to dedicate the necessary effort to determine which program(s) will best fulfill your specific needs. This presentation, led by mbaMission Senior Consultant Rachel Beck, is designed to help you fully evaluate the relevant elements of the different MBA programs to better ensure your final choice will provide the atmosphere, training, lifestyle, resources, and support that fit your particular personality, needs, and goals. With more and more top business schools accepting the GRE as well as the GMAT, a lot of applicants are wondering which test they should take. The tests are very different, so candidates have a lot to consider when comparing the GMAT and the GRE. Manhattan Prep instructor Whitney Garner will walk through the exams’ similarities and differences to help you decide which is better for you, and mbaMission Senior Consultant Rachel Beck will discuss how MBA admissions committees view the two exams and your scores. Every year, admissions officers must choose from thousands of strong candidates to fill a relatively small number of spots in their classes. How do they manage this process and effectively differentiate between applicants? Admissions officers evaluate each candidate using an array of factors, including academic abilities, leadership experience and potential, interpersonal skills, and personal fit with the program. In this session, learn to assess the quantitative and qualitative factors you bring to the table to better anticipate how you might be viewed by the admissions committee at the school of your dreams… and what you can do to improve that assessment! You know you want to get into a great business school, and you have a high GMAT goal score in mind—but what exactly do you have to do to get that score? Join Manhattan Prep instructor Whitney Garner as she helps you understand the big picture with regard to approaching the GMAT, covering key factors such as having the right mind-set, understanding the scoring system, and perfecting your timing. We will help you maximize your learning so you can maximize your score. Of the four GMAT subscores, your Quant percentile typically has the greatest weight with admissions committees. Are you ready to tackle the most difficult GMAT Quant problems? Join Manhattan Prep instructor Jamie Nelson for an overview of some of the most difficult Quant problems. We will review various strategies, as well as guessing techniques, to maximize your chances of succeeding with these tricky questions. Do you have all the basics down but struggle with those really long underlines? Does seeing large chunks of the answer choices move around or change completely drive you crazy? Join us for a special session on how to handle the craziest of the crazy Sentence Correction problems. How can you write essays that grab the attention of MBA admissions committees? In this session, mbaMission will use this simple but often perplexing question as the starting point in a workshop for prospective business school applicants. Attendees will walk through a series of exercises that challenge them to uncover their personal and nuanced stories, craft compelling opening statements, develop meaningful goal statements, connect their goals to their target school’s resources, and other key steps. 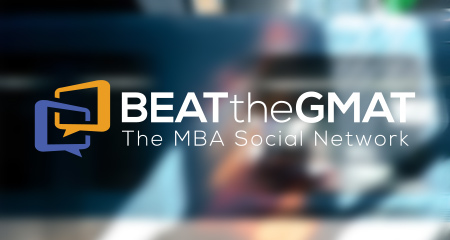 Step 5—Wednesday May 8, 2019: Top MBA Admissions Directors Answer Your Questions! mbaMission’s Jeremy Shinewald will moderate and host this question-and-answer session featuring admissions officers from leading business schools. In addition to posing his own questions, Jeremy will take and share questions from attendees, facilitating a candid dialogue between interested MBA applicants and experienced admissions professionals. This is your chance to go directly to the source to get your admissions questions answered! If you liked this article, let mbaMission know by clicking Like. The author mbaMission gets email notifications for all questions or replies to this post.